Kurt Ernst November 3, 2012 Comment Now! Four-door coupes are all the rage these days, so it seems logical to us that Audi would opt to introduce an S version of its popular A7. Like the all-new-for 2013 Audi S6, the S7 rides on the Volkswagen group’s MLB platform and benefits from a new 4.0-liter, twin-turbo V-8 engine mated to a seven-speed S tronic gearbox, but that’s where the similarities end. Not only does the S7 present itself with more sweeping and graceful exterior styling, it also feels a bit more refined and less boisterous than its sedan stablemate. It’s roomier on the inside, too, thanks to the S7’s 1.4-inch increase in width over the S6. While both cars ride on a 114.7-inch wheelbase, the S7 grows in length by 1.7 inches. That added size adds weight, but not as much as you’d think. The S7 tips the scales at 4,508 pounds, which is just 110 pounds more than the S6. In a straight line, you’ll never notice the difference in acceleration or braking, and the S7 is still fully capable of delivering impressive handling when the road throws you a curve. 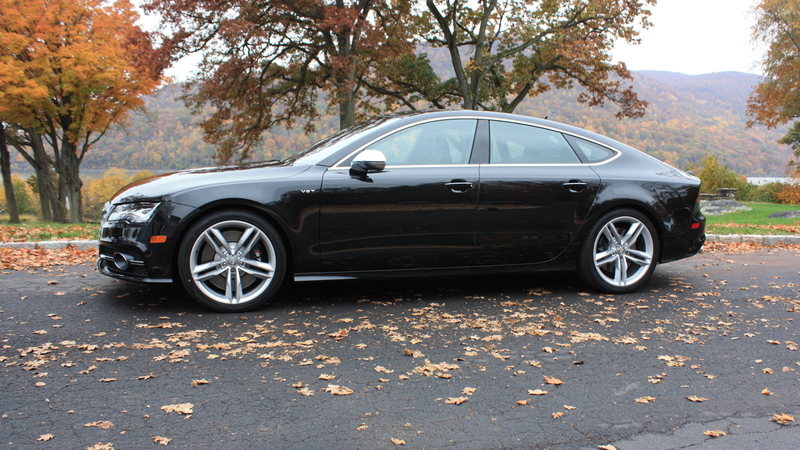 The S7 shares the S6’s biturbo 4.0-liter V-8, which is all new for 2013. The engine is a masterpiece of compact design, with both twin-scroll turbos positioned in the valley between the cylinder banks, instead of outside the engine. The intercooler assembly sits atop the engine, and intake and exhaust ports are located opposite of where you’d find them in conventional engine designs. Intake air enters on the outside of the cylinder heads, while the exhaust exits on the inside of the cylinder heads; Audi claims this design helps to keep intake air cooler. Since the catalysts can be positioned very close to the exhaust exit, they quickly reach operating temperature for reduced emissions. The overall design of the engine makes it the most compact turbocharged V-8 engine in the world, which allows Audi greater interior room to work with. While the S7 makes 420 horsepower and 406 pound-feet of torque, technologies like cylinder on demand (which turns the 4.0-liter V-8 into a 2.0-liter V-4) help the car deliver up to 27 mpg highway and 17 mpg in the city. That’s impressive for a car that can also reel off 0-60 mph runs in 4.5 seconds and achieve a governed top speed of 155 mph. Ensuring that torque is turned into forward motion regardless of conditions is the job of the quattro all-wheel-drive system, which comes standard with Audi’s sport differential on U.S.-spec models. S models also get a unique air suspension with an adjustable ride height, not available in the A model range. Inside, the S7 blends equal parts sport and luxury, serving up an interior that we’d have no trouble calling class-leading. The sport seats, with their thick bolsters and quilted stitching are, in a word, superb, and the carbon fiber trim used throughout the interior is exquisite. As for attention to detail, consider this: the skyliner trim above the dash is a single piece of carbon fiber. It would have been much easier and less expensive to piece together three or four panels, but that wouldn’t have looked quite as polished to Audi’s interior designers. There’s plenty of technology in the new S7, too. Each new S model is a 3G mobile hotspot, thanks to Audi’s relationship with T Mobile. Google voice provides easy access to information on businesses or locations, and Google Earth-based maps make navigation nearly foolproof. Audi’s Drive Select is present and accounted for, too, and it gives users three basic settings for vehicle performance and ride comfort. The best handling is achieved in Dynamic mode, which drops the suspension to the lowest ride height, quickens steering, improves throttle response and decreases shift times. At the opposite end of the spectrum is Comfort mode, which still delivers surprisingly agile handling while serving up the most relaxing ride. In between, there’s Auto mode, which leaves settings in Comfort until it senses a change in the driver’s inputs. There’s also a Custom setting, which allows drivers to change only the variables they want. 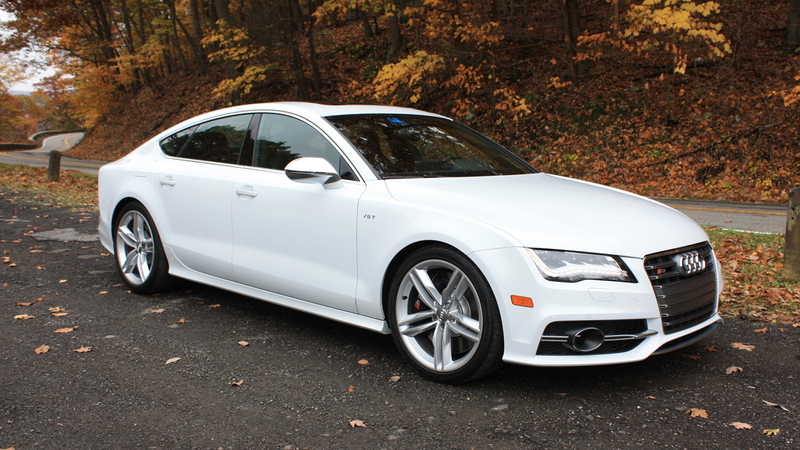 All the technology and luxury is a moot point if the new S models fail to live up to the reputation set by previous S models, and we’re happy to report that the 2013 S7 doesn’t disappoint. Step on the gas, even on wet pavement, and acceleration is brisk and immediate. While much of this is due to the quattro all-wheel-drive, we can’t help but be impressed by the new 4.0-liter V-8, too. The engine pulls surprisingly hard from low revs to near redline, and sounds magical in the process. Not only would we skip the optional Bang & Olufsen audio system, we’d probably never use the factory stereo, content to listen to the engine’s song. Audi gives drivers steering-wheel-mounted paddles for shifting, but we found leaving the seven-speed, dual-clutch S tronic transmission in Sport mode produced comparable results. For commuting purposes, most owners will prefer Drive mode, but when a twisty road opens up in front of you, Sport is guaranteed to put a smile on your face. Despite the car’s two-and-a-quarter ton weight, it feels surprisingly nimble, even in quick left-right-left transitions. Turn-in is quick, but at the limit there’s plenty of understeer, and we see that as a good thing. The S7 isn’t a track animal, and we’ll take the added safety of a little push when driving in the real world. Brakes are surprisingly good, almost to the point of overkill. Grab the binders hard on dry pavement, and your biggest worry will be getting hit from behind. While the S7 is capable of impressive deceleration, the cell-phone-addled driver in the minivan behind you isn’t. 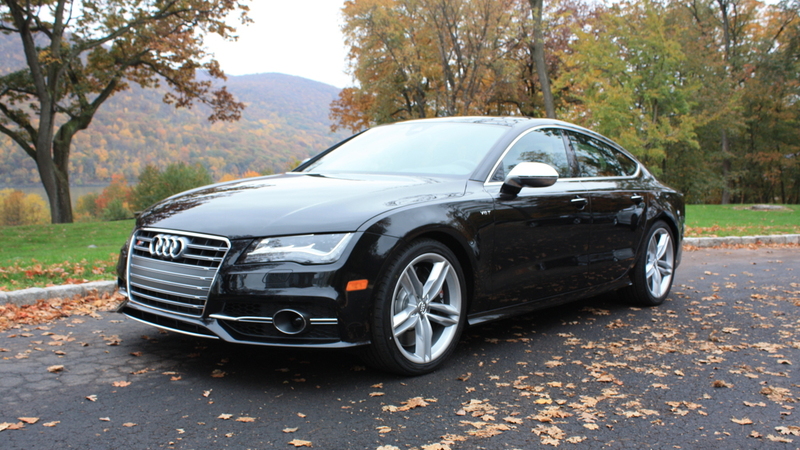 While we were suitably impressed with the 2013 Audi S7, we’s stop short of calling it perfect. In Dynamic mode, with the transmission in Sport, there’s a bit of a stumble off-idle as the car tries to decide which gear to use. This isn’t present on the S8 (which uses an eight-speed Tiptronic transmission), so we suspect it’s a function of the S tronic transmission’s logic. Inside, the sport seats showed a fair amount of wrinkling on the side bolsters after a day of spirited driving. We’d look the other way in a car that stickered for $40,000, but in a car that lists for twice that we expect just a bit more quality. Finally, the Google Earth mapping used borders on too good. As you approach a turn, the mapping shifts scales, making it easy to drive by an exit on the highway. It’s a minor point, though, easily overcome once you’re familiar with how the system operates. 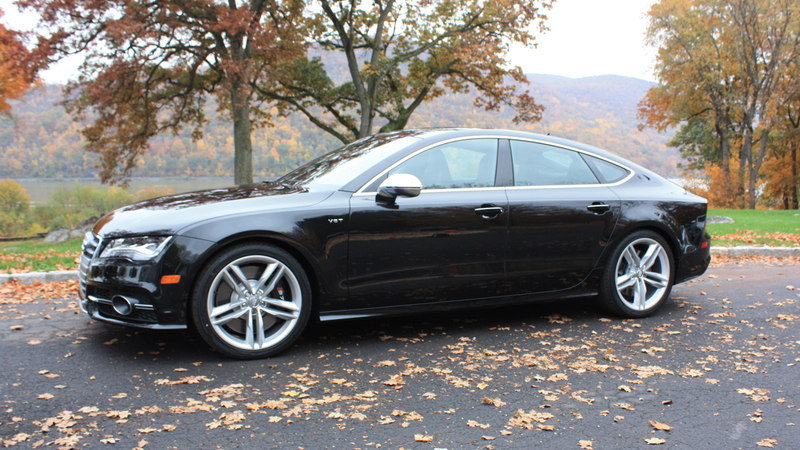 The 2013 Audi S7 is already in U.S. dealer showrooms, at a starting price of $79,695. Disclaimer: Audi provided us with airfare, lodging, really nice swag and really good food, allowing us to bring you this first drive report. They plied us with alcohol, too, but we’d have said the same things even if we paid for the trip from our own pockets.